Founded by Augustus around 27 B.C., the elite Praetorian Guard was tasked with the protection of the emperor and his family. As the centuries unfolded, however, Praetorian soldiers served not only as protectors and enforcers but also as powerful political players. Fiercely loyal to some emperors, they vied with others and ruthlessly toppled those who displeased them, including Caligula, Nero, Pertinax, and many more. 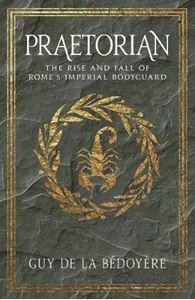 Guy de la Bedoyere provides a compelling first full narrative history of the Praetorians, whose dangerous ambitions ceased only when Constantine permanently disbanded them. de la Bedoyere introduces Praetorians of all echelons, from prefects and messengers to artillery experts and executioners. He explores the delicate position of emperors for whom prestige and guile were the only defenses against bodyguards hungry for power. Folding fascinating details into a broad assessment of the Praetorian era, the author sheds new light on the wielding of power in the greatest of the ancient world's empires.